A strong cold front will move into the area on Saturday with strong storms and heavy rain possible. Much cooler temperatures and quiet weather will follow. Today and Tonight: Similar high temperature numbers of nearly 80 degrees are in store for Friday as the atmosphere begins to change. South winds of 10-15mph will result in some humidity and clouds coming back. 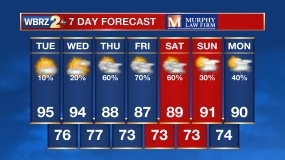 In the onshore flow, a shower or two may develop late Friday. Clouds will continue to thicken overnight with rain and thunderstorms pushing in from west to east near daybreak. Up Next: A strong cold front will work into the area Saturday morning. 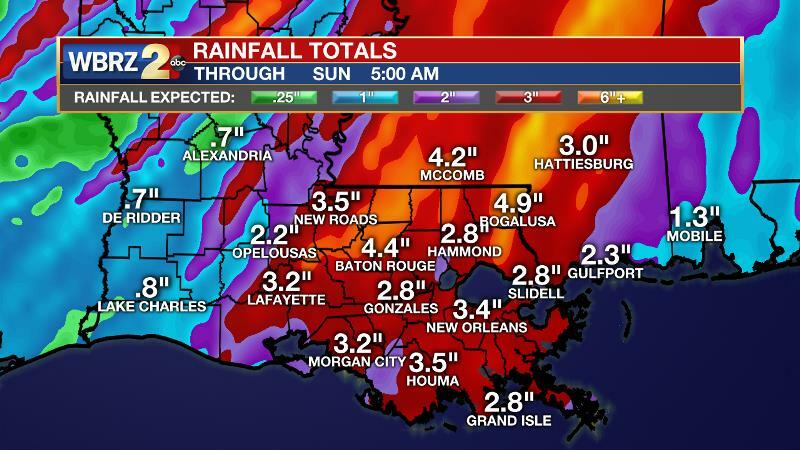 This system will be capable of 2-4 inches of rain, which may cause standing water in typically flood prone areas. Those amounts should be manageable but if the rain overachieves just a little bit, some area rivers could be pushed to flood stage. Thunderstorms could create gusty wind along the squall line and even an isolated tornado. Most of the action will occur around the middle of the day Saturday. The cold front will quickly work east by Sunday allowing sunshine and unseasonably cool temperatures for the end of the weekend into early next week. Record lows and record low high temperatures may be challenged Sunday afternoon and Monday morning but no freezing temperatures are expected. Return flow will bring climbing dew points and it may feel sticky by Friday afternoon and overnight into Saturday. Clouds will continue to thicken through the afternoon but shower development should be limited due to an overall lack of forcing and a cap in the atmosphere. An anomalously deep trough will move from the Midwest to the central Gulf Coast by Saturday morning taking on a neutral tilt. By the time the front arrives on Saturday and forcing increases, severe weather parameters are modest. CAPE values will be in the 1,000-2,000 j/kg range with 0-3km storm relative helicity between 150-250 m/s. The lifted index will be near -5°C. While on the lower end of thresholds, these values are supportive of severe weather. The current expectation is that a line of thunderstorms will be ongoing as it moves into the forecast area on Saturday morning. Cloud cover, pre-frontal showers and a lack of insolation overnight should limit instability somewhat as the storms arrive. Historical analysis of the expected scenario shows the greater likelihood for severe thunderstorms in southern Mississippi and Alabama on Saturday. The Storm Prediction Center has outlined much of the forecast area with a “slight risk” of severe thunderstorms on Saturday and areas from McComb to Baton Rouge to Morgan City and points to the eats are now in an “enhanced risk” of severe weather. Similar to previous events, a squall line with damaging wind gusts would be the most likely threat although a tornado spinning up along the line is always possible. Perhaps more so than the last several fronts, heavy rain may be a concern this time. Precipitable water values will be in the top 10 percentile for the time of year and nearly unidirectional vertical wind profiles may result in a slow moving batch of rain and thunderstorms along the front with some training possible. Forecast models give potential of up to four inches of precipitation. 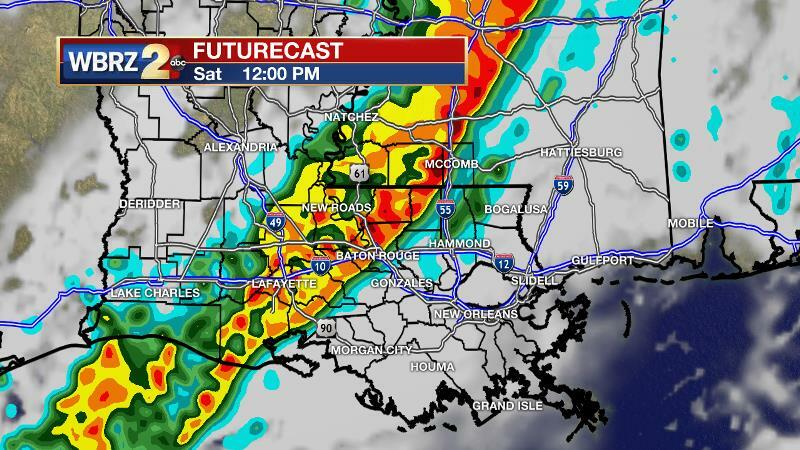 The squall line is expected to move through between dawn and mid-afternoon Saturday. The cold front and trough will rapidly move east on Saturday night allowing skies to clear out and temperatures to fall by Sunday morning. Cold air advection continuing into Sunday afternoon will result in temperatures 10-15 degrees below average for the time of year. The record low, high temperature for Sunday is 62 degrees and forecast models keep readings in the upper 50s to low 60s. Fortunately, there does not appear to be a danger of freezing temperatures on Monday morning, which will be the coolest period in the low 40s and upper 30s. A stretch of tranquil weather is anticipated as temperatures moderate through the middle of next week.